Legislation before U.S. Senators is similar to what was introduced last month by Isakson and Perdue that includes $13.6 billion in overall relief efforts, with $3 billion for critical agriculture disaster relief for farmers in the affected states. Also included in this bipartisan disaster relief package is an additional $600 million for Puerto Rico to maintain enhanced nutrition benefits for low-income families in the aftermath of Hurricane Maria in 2017. 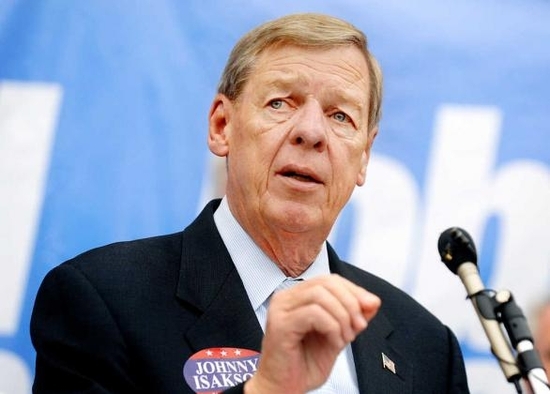 “I want to give you the facts,” Isakson began. “Georgia, which I represent, is one of a number of states that includes Alabama, North Carolina, South Carolina, Florida, Alaska, California, and Hawaii, which have experienced significant disasters. We saw the fires in California on our TVs. We saw the volcanoes in Hawaii. We saw the blueberries in Georgia fall off the vines and be destroyed [by late freezes]. We saw what happened to these crops and Alaska’s earthquake. All of these states have received nothing yet. Puerto Rico has received $40 billion — $40 billion for what happened during [Hurricane] Maria, and $21 billion has not been spent. In his speech, Perdue spoke about the “unacceptable delays” in the relief funding coming to Georgia.